FDEV Menu Show search box. If you have any suggestions or requests for our office's services, please let us know! On April 26th from 4:00 p.m. - 7:00 p.m., Lecturers are invited to the second annual Lecturer Appreciation Celebration at the University Farm. Come enjoy appetizers, beer/wine, music, tractor tours, and prize drawings (including a few $100 gift cards to local restaurants). We hope you will join the fun and you are welcome to bring a guest. So that we order plenty of food and beverages, please RSVP(opens in new window) by Sunday, April 7th. For more information, please contact our office! 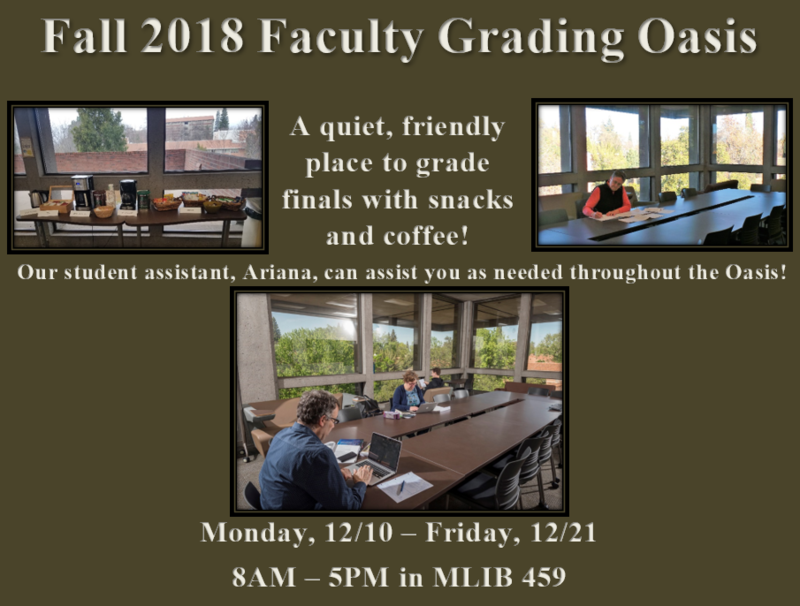 Come to our Fall 2018 Grading Oasis! Starting Monday, 12/10, we will have free hot coffee, decaf, hot tea, snacks and fresh fruit for faculty (including T/TT and lecturers) from 8AM - 5PM Monday-Friday in the Rose Garden Room(opens in new window) (MLIB 459) until Friday, 12/21. Drop in at your leisure to grade, read, write, or do whatever you need to get done. We’ve updated the space with some new décor and the amazing view is always refreshing. Our student assistant, Ariana, may be available to assist with some grading as long as student names are not visible. This event announces a partnership between Faculty Development and Meriam Library to provide the Rose Garden Room (MLIB 459) as a dedicated drop-in space for faculty to use, 8 AM - 5 PM Monday through Friday, and graduate students to use at all other times. The Open House will have light refreshments throughout the day and lots of fun activities! The flyer above includes the event's basic itinerary. For more information, contact FDEV(opens in new window)!